First let me show you what I got done and then I'll tell you the story about my post title. This is the final layout for the log cabin blocks. I will fill in with a medium or dark batik at the edges so it will simulate a border. I made 3 more blocks for this ongoing project. They are the beige and soft rust ones. I wasn't sure if they would look good with the rest but I like them in there. They are restful in the background while others show their colors. 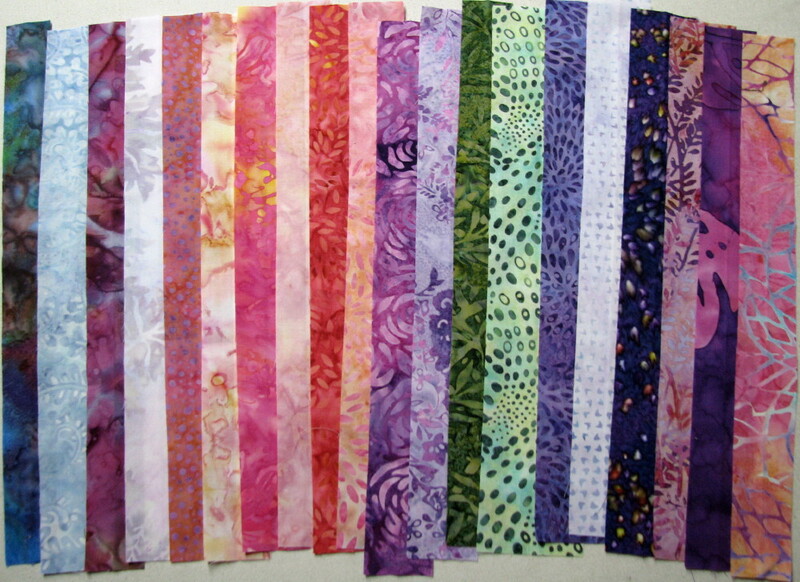 Here are the first 20 fabrics of the 72 that I am cutting for the Winding Ways quilt. I am cutting 2 squares of each fabric so that will make 4 blocks for each pair of fabrics. 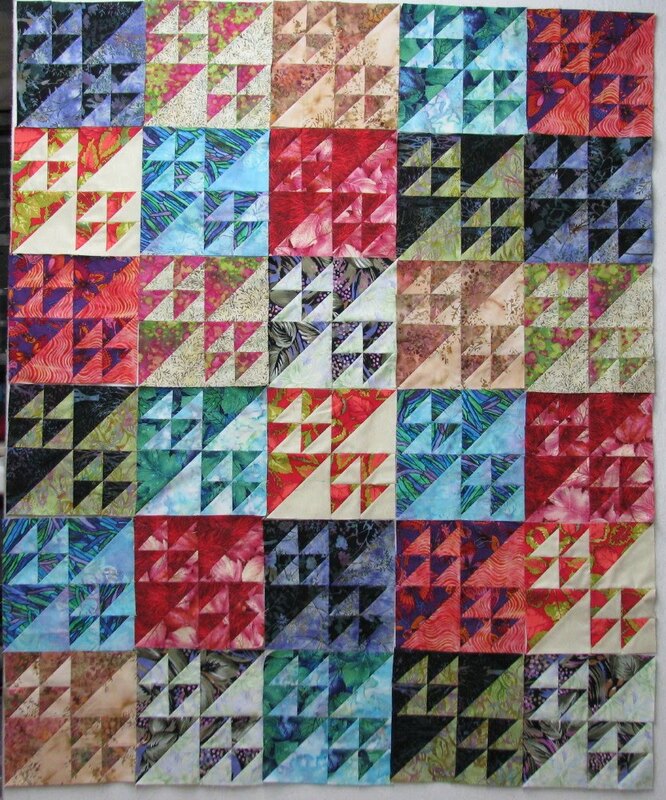 I went on the hunt for pictures of Winding Way quilts on Flickr and found one done scrappy within each block. Now I think I will just pair them as shown for the first 2 blocks and use the second set of pieces for a scrappy version. I got 8 more cut after I took this picture. I'll have more pictures of my cutting tomorrow. Now for my story: First I need to tell you that my cell phone is with a carrier that is updating its towers to 4G and for the last 3 weeks I have had roaming or no bars most of the time, with one bar part of the time so I couldn't leave home and depend on a call getting through. So on with the story. I called Lifeline last Fri. for my dad and was told someone would call within 1-2 business days with the installation time. Somehow that meant to me that he would probably have it installed by late Tuesday. Wrong! First of all I had to stay home (grounded) to wait for the call all day Monday. No call. By 1:30 yesterday (Tues) I was convinced they might not have my correct phone # so I called them. The lady said she would check, came back on and said an installer would be calling me shortly. By 4:30 I still hadn't heard and I was afraid their office would close at 5 so I called back. Each person I talked to said "stay on the line" and I'll check. Each time it kicked me back to the "Welcome to Life......" and a different agent answered. By the time the 5th one answered I was becoming unglued (and that's not a pretty sight!) and I was trying hard not to cry as I told the story for the 5th time. That last nice guy found out my dad's installer wasn't answering her phone and he lined up another one who called me at 8:30 last night and said she will be there between 9 and 1 today. Whew!!! So now you can see how much I can get done if I'm grounded. There is no such thing as customer service any longer. Thank goodness there ARE such things as excellent quilters who just happen to possess extraordinary PATIENCE!!! So sorry for your trouble and frustration. You revealed to me that when life hands Wanda lemonades, she makes GORGEOUS piecework!!! The log cabin is amazing, Wanda! Looking forward to seeing it done. I don't remember, did you say how wide the logs are? They look so small. I can't wait to see what you do with the winding ways! Beautiful quilt! Praying for you and your dad still. I am in love with your log cabin! You certainly were able to get a ton done while being grounded. So glad you hung in there and finally spoke to someone on Lifeline. What a frustrating call though. It is understandable that you would become unglued, I would have too. Glad the installation will be taking place! That quilt is WONDERFUL!!! I hope the Lifeline installer is out there today during the times they promised. Craziness! I wish I could be as productive when craziness hits my life! Here is hoping for some peace today...and a Lifeline. Ouwwww! I hate it when that happens. I would have lost my 'cool'. Love what you have accomplished though. 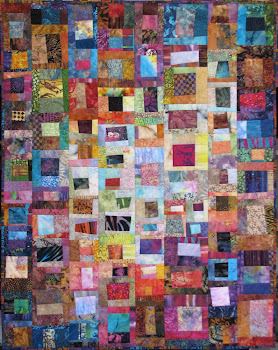 Can't wait to see the Winding Ways quilt. Don't you love customer service like THAT???? Grrrr. Love all of the blocks, Wanda. The Log Cabin is just gorgeous and the "continuing" project looks fabulous. I can't wait to see that Winding Ways. Oh man, that takes me back to the year I spent in FL with my dad. NOTHING was easy, it seemed. I think, Wanda, we are in the "too old to deal with that crap" and "too young not to have to" if you get what I mean. It used to be that it was only the cable company you had to wait for. Now it's every place. Oh, the frustration of dealing with a company whose customer service line does something like that! I am so glad you finally got an answer and hope that the installer does show up on time. Wow, did you ever make good use of the time you've been grounded. The log cabin top is stunning. 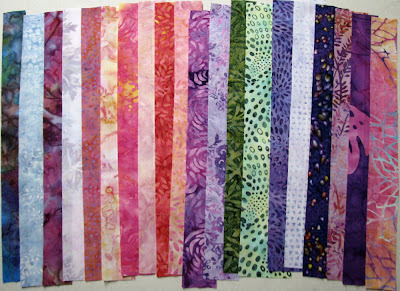 Your Winding Ways is going to be gorgeous -- those fabrics are beautiful! How frustrating....I hate waiting for calls like that, and that is important to get set up for your dad at this time too...not like you just want a different cable service or something! Why, oh why, do things that should be so straight forward (I want to purchase your service, you do what is needed to make me happy) take SO much effort on OUR part to establish?!?!?!?! Good for you for being persistent - I'm just sorry that it took so much stress on your part. The log cabin is especially wonderful!! 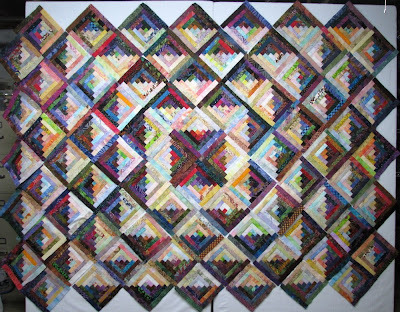 The log cabin quilt is spectacular! I haven't seen this layout before--it's very dramatic, enhanced by how you've put the brightest lights in the centered and then they darken a bit as they go out to the edges. Inspiring! 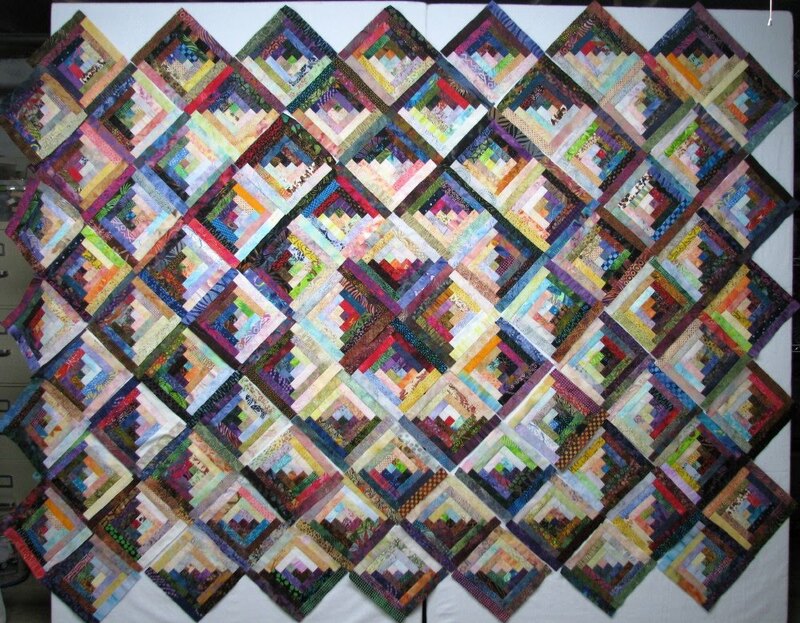 Log Cabin quilt is awesome... Love your design. Your design that you have created with "On going project" has great dimension. I always wondered about Life LIne... now I know. If they treat a prospective customer like they did you, will their service be the same ? I hope that you don't need to deal with those folks again, and that by the time you read this the installation has occurred. I think every elderly person needs to have an advocate with him/her at all times to make sure things happen. Love the layout of the log cabin. It looks like your lights are a bit darker in each round. That deisgn element just draws you into the quilt. I'm sorry. I hate to be on the phone with most any business these days. I feel fortunate if I get a representative whom I can even understand. But you have improved your time by doing so many pretty things! I so like the layout for your log cabins. It is really striking. I love your log cabin quilt, as well as the next quilt. I have never seen a log cabin in this layout before. 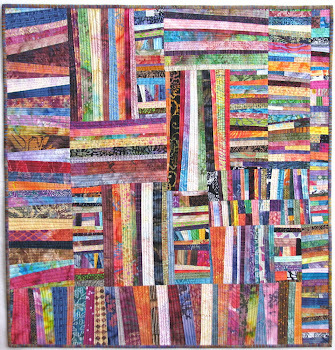 That is an amazing quilt; you certainly have the gift of seeing effects where many people wouldn't even know to look. It's just great. I truly empathize with your experience trying to get help for your dad. You shouldn't have had to go through that at all! Thank heavens it worked out okay. I'm just sitting here shaking my head...Take care. Both quilts are looking amazing! Bad customer service drives me absolutely batty. I have had a couple of surprisingly positive customer service lately and one of those was at WAL-MART! It seems to me that people would be a little more concerned about their jobs these days but that doesn't seem to be the case. I hate calling customer service for the very reasons you talk about. They all use a "script" and can NOT deviate from that no matter what your problem or question is. I hope it was installed and I'm sorry you had such issues with them.